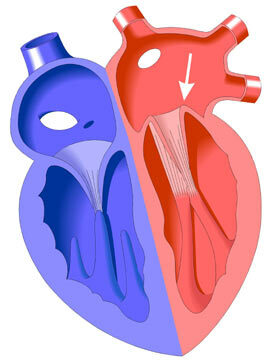 The Mitral Valve regulates the movement of blood from the left atrium, or left collecting chamber of the heart, into the left ventricle, the main pumping chamber of the heart, which pumps blood to the body. In Mitral Valve Prolapse (also known as MVP), the valve is abnormally formed in such a way that the two valve leaflets (or flaps) are too large and bend backwards (prolapse) into the left atrium as the heart beats. The degree of prolapse is variable. This is a fairly common heart defect, probably genetic in origin, that affects about 2% of the population. It occurs in approximately twice as many girls as boys. With left ventricular contraction, notice that the leaflets of the mitral valve tend to balloon upward into the left atrium in this defect.